In Focus - The Coolest Game You'll Probably Never Play! 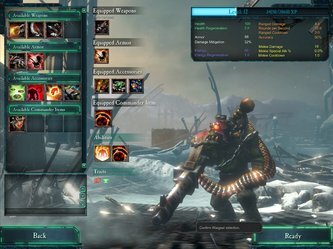 In Focus Review - Atlas Brush Company, Inc.
PC Review - Warhammer 40K/Dawn of War II: Chaos Rising. 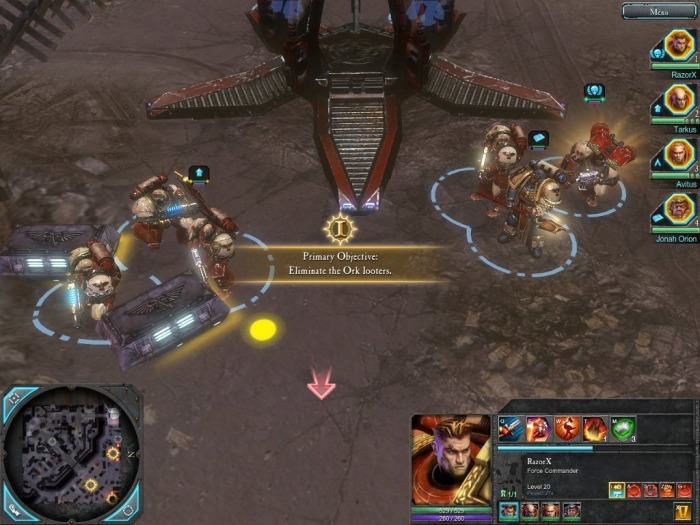 Chaos Rising is the long awaited expansion pack for Warhammer 40k: Dawn of War II. 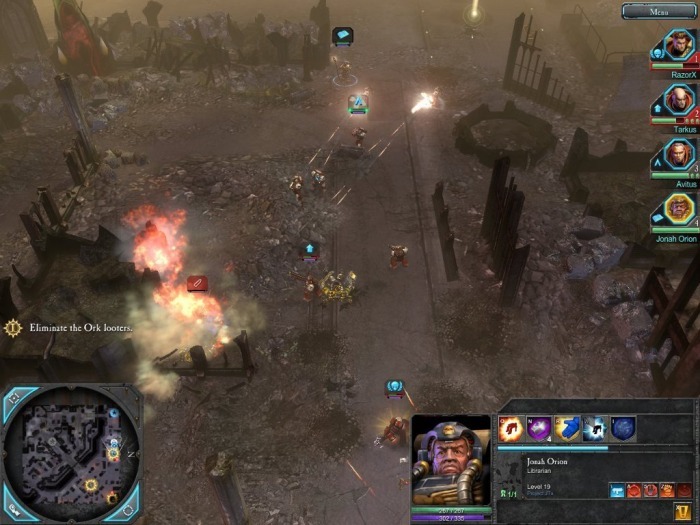 Like the later expansions for the original Dawn of War, Chaos Rising for Dow II is also a stand alone game, in addition to being an expansion to DoW II. Dawn of War II introduced us to some of the worst Digital Rights Management nonsense in gaming history. With great sorrow I must report that even with as many complaints as they had with DoW II, Chaos Rising's DRM is no different. Don't expect to run off to GameStop or Best Buy to buy this DVD, bring it home, install it from the DVD in 5-10 minutes like any other PC game, and then sit down and play it. Forget about that EVER happening with DoW II, or Chaos Rising. Heck you're better off just buying them from Steam, because you're forced to download all of the content anyway from Steam. Even with cable modem internet, this process took me about 4+ hours. The only benefit to this, is that you're getting the latest, patched version, so it's the most up to date version once you're done. Still, I'd rather install a game like I do any other, from the DVD in 5-10 minutes or less, and download a patch as needed, than to ever go through this crap. Without internet access, there's no way to install, or play this game either. All that downloading doesn't include the Live update needed for the integration of Games For Windows Live either, since DoWII/Chaos Rising integrates a Live.com account with DoW II to use as a profile to be used in the games. Therefore expect to wait another 10+ minutes to get all that straight. If you didn't already have Steam, add a few more minutes to download and setup a Steam account as well. Although I can't complain much about the Windows Live thing, because it is nifty that it integrates a Windows Live PC game account with your existing Xbox Live account, into one single gamer profile. It's only annoying to have to deal with it, after having just went through the initial inconvenience caused by the stupid DRM nonsense, and Steam integration. Now 4+ hours later, I'm finally ready to play Chaos Rising! 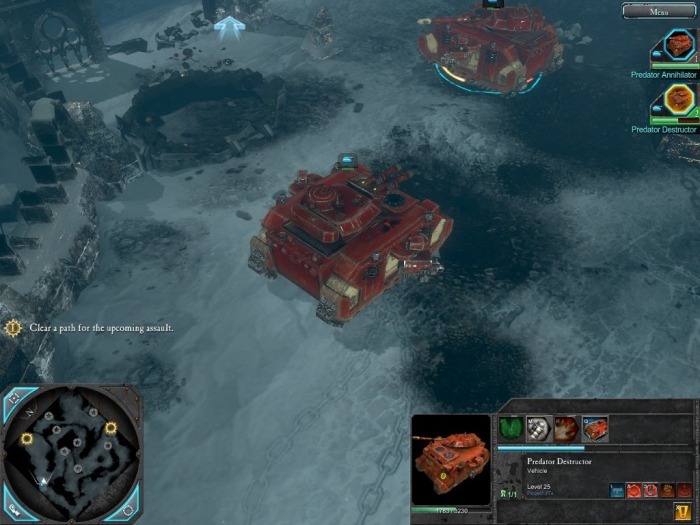 Chaos Rising continues on, where DoW II left off, as you command an army of Blood Raven chapter Space Marines, only this time the primary challenge you face is in the form of the Chaos Space Marines. You will face other foes along the way, like Orks, Eldar and Tyranids as well, but the campaign revolves around the Chaos Space Marines showing up from the Warp and laying siege to the galaxy. Like Dawn of War II before it, Chaos Rising is a real time strategy (RTS) game, but with Role Playing Game (RPG) elements mixed in. 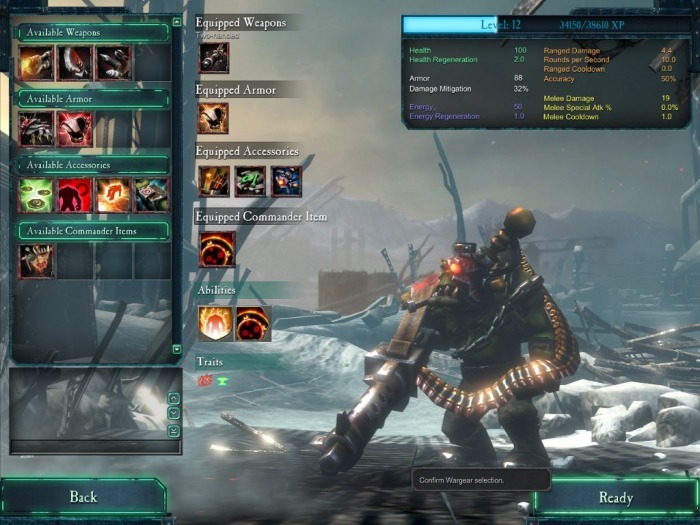 As you make your way through the game, your force commander and squad leaders level up, obtaining new powers and abilities, and you accumulate new and different wargear items throughout each level to equip your Blood Raven Space Marine Force Commander and Squad Leaders with. This time out, there's a new element to it all, corruption. As you are given choices, some of the ones you decide to make, will effect the taint-level of your characters. 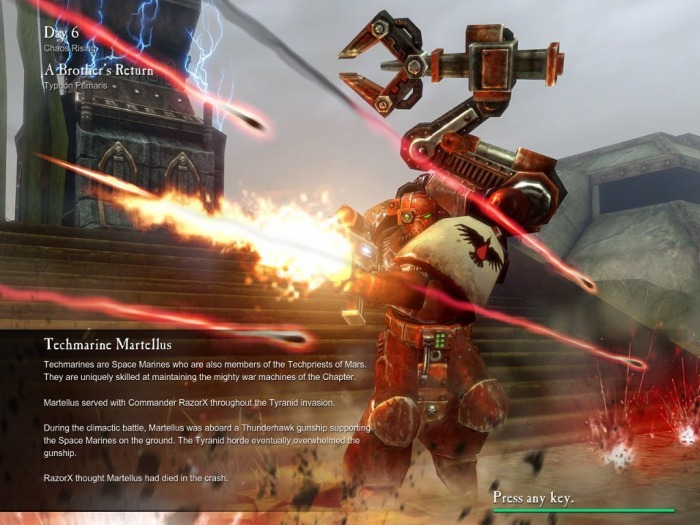 Therefore as you make your way through Chaos Rising, your loyal to the Emperor Blood Raven Space Marines, can slowly become influenced by the warp and the dark powers of Chaos, in effect turning them into Chaos Space Marines right before your eyes. Certain items and wargear that you pickup, if you decide to use them, will also effect how tainted, or corrupt you become, further pushing you towards the dark-side. Some pieces are so good, that the temptation to use these items is too great, so corruption is almost inevitable. It's an interesting element, which goes all the way back to the old StarWars: Jedi Knight games, and even Fable, where the choices you make, decide your allegiance to the dark, or light side, and you must deal with how which side you choose decides your fate. The missions themselves are fantastic. With a variety of difficulty levels, even going the easy route can be somewhat challenging in the later missions, because it's not so easy that you'll fly right through unopposed. 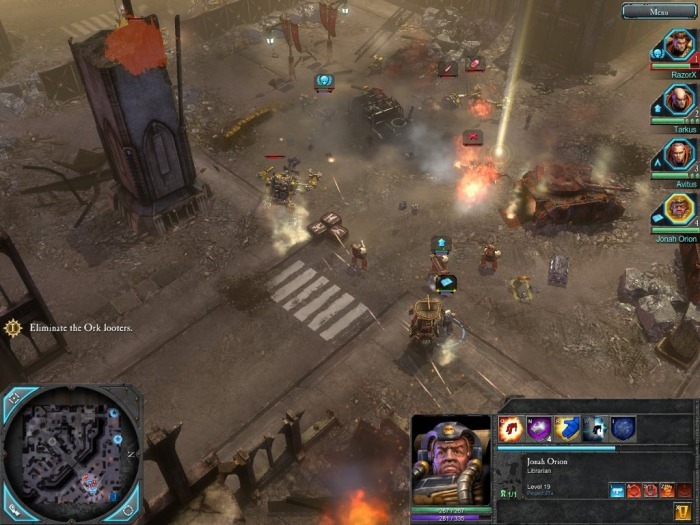 Most are multi-part missions, with multiple and optional objectives both. 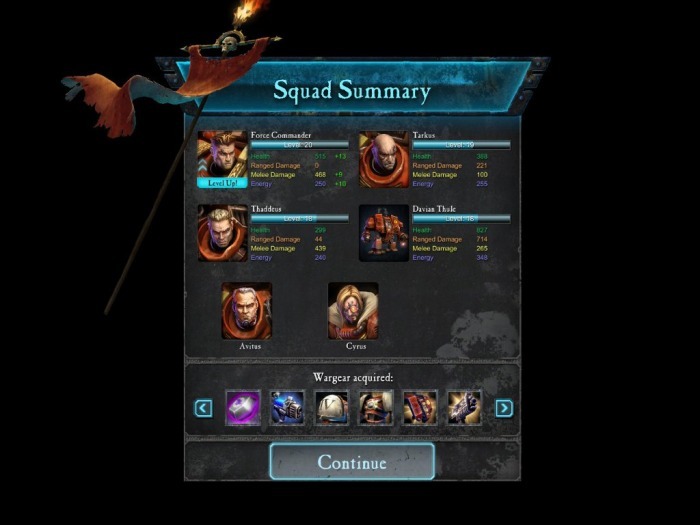 As you make your way through the campaign, from time to time complete optional side missions become available too. Frozen Tundra, lush jungles, barren city-scapes, even interiors of giant abandoned ships are just a few of the environments where the missions take place. 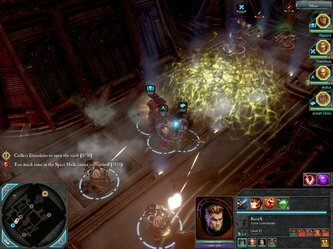 One particular mission takes place on a derelict space hulk, versus the Tyranids, which pays homage to the now classic, and recently re-released GamesWorkshop board game called Space Hulk. Which in itself, was a ripoff of the classic Aliens movie. That was a really nice touch that the core Warhammer 40k enthusiasts will appreciate. Overall there's about 15 missions in the campaign, and the campaign itself is a lot more in-depth, and more fun than the original Dow II campaign. The campaign isn't terribly long, but you don't feel shortchanged either. I think it's just about right, as all of the missions on average take 20-40 minutes to complete. The different possibilities of random wargear drops, and the corruption mechanic, do give you some replay value too. 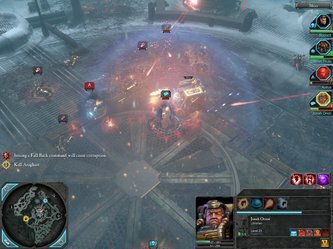 There's also excellent multi-player support, and a variety of game types in place, once you've worn out all of the single player content. Another interesting twist, is that even when you loose a mission, you're just “Emergency Extracted” from the planet, instead of it counting it as a loss. Therefore it feels less like you failed. 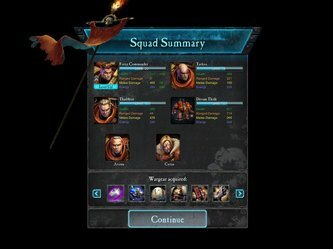 When it goes wrong, simply re-setup your squad, to go back and try again. The AI aren't innovative, or groundbreaking either, it's a simple matter of once you trigger them, they get up in your grill, until either they die, or you die. They'll chase you down once activated, but they're far from smart. 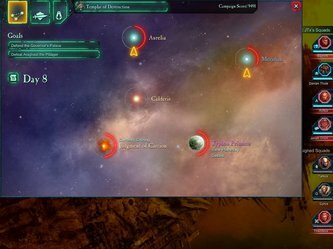 While the missions are really fun, and well scripted for maximum fun factor, the AI rely on the tried and true method of throwing wave after wave at you, until one of you falls. 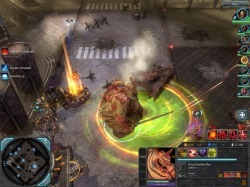 You can almost expect after every couple of missions to find a boss too, which will throw a few waves of minions at you, and then they'll either die, or a new cut scene interrupts their death, to begin to set the stage for the next mission as they get away. I can't say you can predict how the missions will unfold, because they're scripted so well, but you almost certainly can guess how they'll end. Visually speaking, the game is fantastic looking. 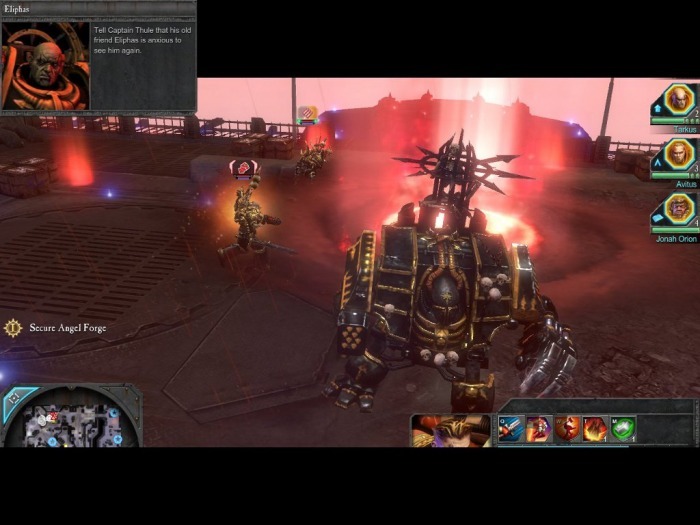 I've played Chaos Rising on what I'd say are two mid-range machines (equipped with dual, and quad core processors, and 9500 GS/9750 Extreme nVidia video-cards) with most of the visual bells and whistles maxed. On both configurations it runs great, and looks amazing at some of the highest resolutions supported. Ironically, I've only seen the slightest chop, or slow down when running some of the cut-scenes, but this could also be because I was running a graphics program, and word processor both in the background while playing the game. Highlights for Chaos include the Great Unclean one, who is a Nurgle faction Chaos demon, Plague Marines, Khorne Blood Letters, Chaos Sorcerers, various Black Legion army types, Traitor Legion Imperial Guards and Champions on Khorne Beasts are also present. 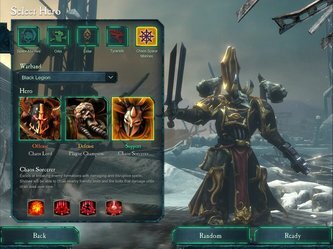 You can also upgrade the various units with the Mark of Nurgle, Knorne and Tzeench, but oddly Slanessh is missing altogether. I'd also go out on a limb and say that you really don't even need to be into, or know about Warhammer 40k to enjoy Chaos Rising, or Dawn Of War II. 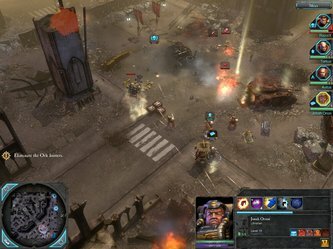 It's such a solid sci-fi RTS game with RPG elements, that it stands on it's own quite well. If you are an enthusiast of the tabletop skirmish game version of Wahammer 40k, it's a bonus, because there really is so much accurate depiction of the lore, and character types to be found portrayed throughout the game. Hearing and seeing the models you've assembled, painted, and played with for years, as they come to life before your eyes and ears is simply awe-inspiring. I'd have to say the voice acting is also top notch, they didn't drop the ball anywhere in this game in terms of presentation. You really believe this is the 41st Millennium, and it really feels like the Gothic, and almost space opera-like setting which is the world of Warhammer 40k. So you don't need to be filled in on the background to appreciate Chaos Rising, but if you are familiar with 40k, it's that much more of an immersive experience. 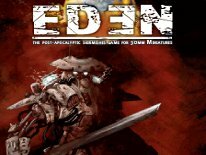 I really can't fault it for being what it is, and that's a really fun game, which in every way oozes the 40k universe visually, audibly, and right down to how the characters and weapons work. 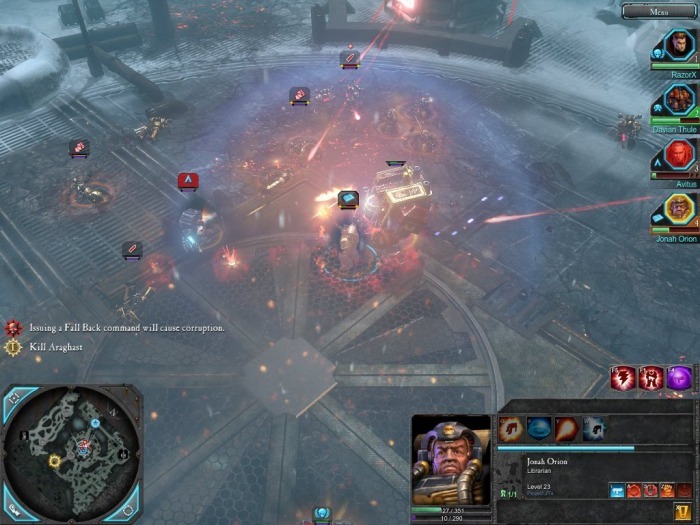 This is definitely a treat for enthusiasts of the actual tabletop skirmish game of Warhammer 40k. Granted some of the most diehard enthusiasts can put it under a micro-scope, and say it didn't do this, or that by the book, but come on, this is unquestionably the best digital interpretation of the game to date, no ifs, ands, or butts about it. 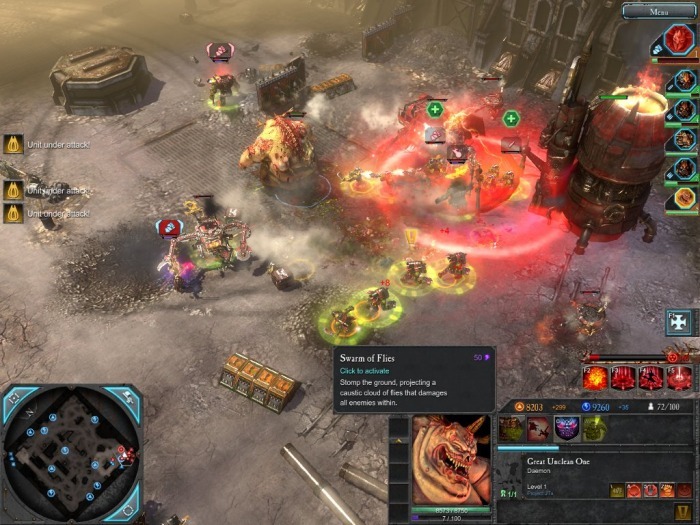 Chaos Rising picks up right where the Dawn of War II left off, putting you right back into the thick of things, and you can even import your existing Dawn of War II force commander over into Chaos Rising. The new single player campaign is a great fun, the level cap was raised to lvl30, from the previous cap of lvl20 from Dow II, and there are loads of new, and more powerful wargear items to be found. There's also quite a few new achievements to be earned, for those looking to beef up their Live gamer profile some more. 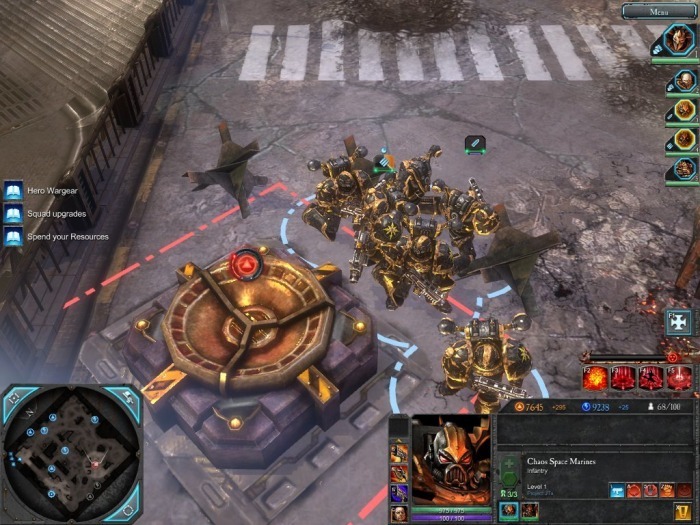 Last Man Standing multi-player mode, along with the other multi-player options also make Chaos Rising a lot fun over the internet. New units for the Space Marines, Orks, Tyranids and Eldar, along with a variety of new maps for multi-player are also added via Chaos Rising to the existing Dawn of War II multi-player options. I've played hours worth of Last Man Standing, and the basic Skirmish mode vs the CPU foes, and I have to admit to being addicted to both. Since it's a totally stand alone game, in addition to being an expansion, the price of $29.99 is very reasonable. For $10 more you can get the Gold edition featuring both DoW II and Chaos Rising together, and if you didn't have DoW II already, that's the way go. It's well worth having both, as Chaos Rising, I think, is as good as DoW II, maybe even better since there's more of what made DoW II a great game to be found within Chaos Rising. The only thing I really cannot stand, is the absolute freaking idiotic Digital Rights Management process through Steam. I see no reason at all why anyone should be forced to sit, and wait HOURS to install and play any game. It's mind blowing that they bother to put a DVD in the box, when it forces you to download 6-Gigabytes worth of the data direct from Steam through the internet anyway. When my son first bought DoW II and we had to deal with this crap the first time, you should have seen how upset my 13-year old was when he learned it would likely be the rest of the afternoon, before he could play the game he just shelled out $50 for. No kid, or adult should be subjected to this stupidity. If you can accept the DRM nonsense, Chaos Rising really is a stellar game, but before you pick it up, you might just want to consider buying it from Steam direct, since you're forced to deal with Steam anyway. Be sure to visit our sponsors!